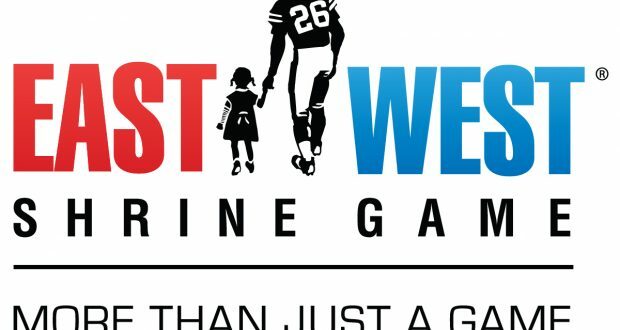 Long looked upon as the lesser of the college Senior All-Star games the East-West Shrine Game has nonetheless played host to scores of dynasty relevant players. Players such as Brett Favre, Steve Smith, and Elijah McGuire have taken the field in this charity contest on their way to NFL career’s. This year was no different than past years as scores of players with NFL dreams took to the field in the hopes of showcasing their skills and improving their draft stock. Coaches for the game are drawn from the ranks of NFL teams with this year’s signal callers being Carolina assistant Sam Mills and Minnesota assistant Adam Zimmer. Here are some of the players who stuck out to me and a brief overview of their play during the game and what coaches said about them throughout the week. The best Quarterback play I saw during this game came from the kid from Boise. He displayed slightly above average arm strength and great touch throughout the day. The nephew of the former Super Bowl MVP had a fine day to the tune of 10 of 14 for 134 yards and a TD. 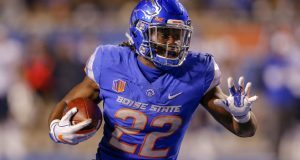 He had a nice career at Boise compiling a 40-13 record to go along with a 90 to 29 TD to INT ratio. At 6’2 200+ lbs. Rypien has both the size and the blood lines to make some noise at the next level. He will likely be a mid to late round selection in the upcoming draft as a backup but could be groomed in a Tony Romo esque fashion to one day take over an NFL team if he lands in the perfect situation. 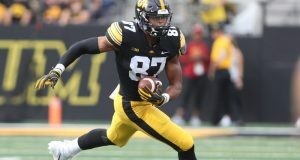 Throughout the practices leading up to this week’s game the coaches praised his work filling in at the wide receiver positon as the West Team dealt with injuries. Brossette was an integral part of the 8 play drive to open the game for the West Team. He showed good hands which he particularly displayed on a beautiful 22 yard wheel route that he took for the game’s opening score. His game reminds me a little bit of James Conner. If he finds himself in an ideal landing spot I think that he could be a fine committee back with upside for a bit more. Johnson is an interesting prospect having averaged 7.6 ypc over the course of his four years at College Park. He is top 5 all time in total yardage in Maryland history. Johnson received mostly positive reviews from the coaching staff’s leading up to the game. During the actual game I felt that Johnson showed much of the burst and cutting ability that made him one of the top running backs at the University of Maryland. I was particularly impressed with a pair of 1st down runs he ripped off on the East Team’s first drive where he showed impressive burst and cutting ability along with the ability to read and set up his blocks. Johnson reminds me of a smaller Terrance West type of prospect. I will be following him in the upcoming draft process to see how he tests at the combine and where he ends up after the draft process plays out. The player who disappointed me the most during the game was Jonathan Duhart. Despite his 6 targets he was only able to bring in 2/13/0. Despite his lackluster in game performance I will still be monitoring him in the upcoming draft process. For those of us who watch a lot of college football we tend to remember big upsets by small schools over traditional powerhouse programs. Old Dominion pulled off one of those upsets this year over Virginia Tech. I remember watching highlights of the game and being transfixed by the star of the game Jonathan Duhart. The young ODU Wr shredded the Virginia Tech D to the tune of 9/142/3! It was one of the more dominant performances by a Wr in any game I saw all year. During this past weekend’s game I was left wanting so I will be watching him closely in the upcoming process to see if the big game I saw was a mirage or if other circumstances led to his disappointing performance. Another player who has NFL skills who flashed throughout the week yet disappointed in the game was DaMarkus Lodge. Much like Terry Godwin it was hard for Lodge to stand out in the crowded group of talented Ole Miss Receivers. Despite his lack of college production Lodge will undoubtedly have a future in the NFL. He has the size and physical tools to make an impact on the next level. Despite his skills Lodge failed to garner a single target during the game and will thus go into the draft process relying on his SEC film unassisted by his East-West Shrine game performance. The offensive MVP of the East-West Shrine game was Terry Godwin II the senior WR out of the University of Georgia. Coming out of the crowded receiver group at UGA Godwin had a hard time making his mark on the stat sheet. His best season was his junior year in which he posted a 38/639/6 line. His performance in the East-West Shrine Game displayed the impressive skills that likely took him to Georgia in the first place. The 5’11 185 lb. receiver showed soft hands and the ability to consistently separate from defenders to the tune of 4/80/2. Coaches called him the most impressive receiver throughout the week. His game reminds me of former Jets 3rd round pick ArDarius Stewart. If selected to the right team Godwin could be a fine slot Wr. One of the players who most caught my eye during the game was the young WR from Arizona. As a former Volley Ball player the lanky Poindexter possesses an impressive skill set. It took him some time to learn the receiver position but towards the end of his college career Poindexter became a dominant scoring machine putting up 42/759/11 in his final year of school. Impressively 10 of his scores came in the final 5 games of his college career. He is still quite raw for the positon but possesses an intriguing developmental skill set for NFL coaches to work with. During the East-West Shrine game Poindexter 4/71/1 displaying his big play potential. Of the Tight Ends I saw during the game the player who stood out the most to me was the TE from Texas. The two-time team captain from Austin is an above average blocker with adequate speed and soft hands. He made a couple very nice blocks from the fullback position to go along with his routes out of the slot and off the end of the line of scrimmage. I doubt he is ever a fantasy stud but he does possess a similar skill set to Kyle Juszczyk and could likewise fill several roles on a professional squad. One scout said of Beck at the Shrine Game that he was the type of player who could have a 10 year NFL career. Conclusion: It is impossible to tell if any of the players from this past week’s All-Star game will become long term dynasty assets. It is however a good practice for dynasty owners to perform as much of their own personal scouting on players coming into the NFL as possible. All-Star games such as the East-West Shrine Game and the upcoming Senior Bowl provide excellent opportunities to watch large groups of players and to listen to commentators give the collective opinions of coaches and scouts who have worked with the players outside of their home university comfort zones. I would suggest that if you have the time you check out these few players who caught my attention both throughout the week of practice and the game itself. Happy scouting my friends and hears looking forward to draft season.